Nashik more popularly known as the "Wine Capital of India", or the "Grape City" is also known for its culture and tradition for it is a major Hindu pilgrimage center.Nashik is a city of tumult from stirring or excitement is a mixture of the ancient and the modern culture.This is one of the holy paces of the Hindu for Lord Rama, hero of the epic Ramayana, spent the major part of his exile here and also the city is housed with numerous forts and majestic temples. 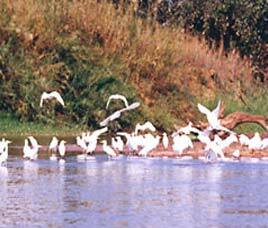 Nashik is not only a pilgrimage attraction but also accommodates a number of industries. It is here where the Security Printing Press of the government, which prints the nation's currency, is located. Another major feature of Nashik which draws a huge crowd is the Kumbh Mela which occurs once every twelve years. Nashik is situated in the northwest of Maharashtra which is about 185 km from Mumbai. The city present at an altitude of 565 m above the sea level is located in the Western Ghats, on the western edge of the Deccan peninsula on the banks of the Godavari River.Nashik is encircled by nine hills- Durga, Ganesh, chitraghanta, Pandav, Dinger Ali Mhasarul, Jogwanda, Pathanpura, and Konkani. History says that it is in Nashik where the hero of Ramayana Lord Rama, along with wife Sita and brother Laxmana stayed here for a while during their 14 year exile during which Ravana abducted Sita.Nashik got its name from the event of Lord Laxman, brother of Rama cut off the nak (nose) of Ravana's sister Surpanakha.Nasik was the capital of the powerful Satavahana (also spelt as Satvahans) dynasty. It was an important trading port to the west. The city of Nasik was called as "Gulshanabad" during Mughal period. Later, it was again given its old name when Peshwas took over in 1751, but they lost Nasik to the British in 1818.Nashik was formed into a district in 1864 divided into 13 talukas. This festival is celebrated on the 14th of January and on this occassion the sky is filled with multi-coloured kites of different patterns and dimensions. All age groups fly kites and take on bids to cut each others kite string. This event is commemorated every three years and is held at each thirtha in turn; the Sangam is known as Tirtharaja, the king of tirthas and its mela once every twelve is the greatest and holiest of all. The Maha Kumbha Mela is the largest religious fair in India attended by literally millions of rejoicing the vast floodplains and river banks adjacent to the confluence are overrun by pilgrims, tents organized in almost military fashion by the government, the local authorities and police. Diwali another common festival of lights is celebrated with the same enthusiasm as the rest of the country. There are versions of origin of this festival; the most popular is of Lord Rama's return coronation to Ayodhya after his 14 year esxile. This is a fascinating festival where long chariots or rath are taken in procession with images of LORD Jagannath and his brother and sister. The arge chariot is about 14mts high and 10mts square on with 16 wheels.This chariot is pulled by millons of devotees or about two kiometres. 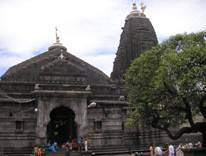 The deity worshipped in this temple is Lord Vishnu who is also reffered by the name Sundarnarayan.This temple was built in 1756 by Gangadhar Yashwant Chandrachud situated near Ahillyabai Holkar Bridge in Nasik. This temple got its name after a Maharastrian dish made of coconut and jaggery known as 'modak'and is believed to be the favourite dish of Lord Ganesh who is the deity of worship in this temple.The idol in the temple is believed to be self emerged and is also known as 'Swaymbhu'. This is one of the 12 sacred jyotirlingas. This temple which is devoted to Lord Shiva was built in 1730 by Baji Rao Peshwa. 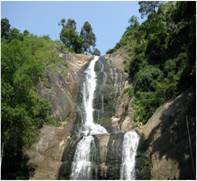 It is said that the source of Godavari river lies few hundred feet above the temple. Although the Non-Hindu is not allowed inside but they can go up till the steps and take a look inside. The architecture of this temple is a blend of both Malwa and Meru style in its architecture. The main presiding deity of this temple is Saptashringi goddess or otherwise commonly referred as Lord Shakthi who is depicted with 18 hands. 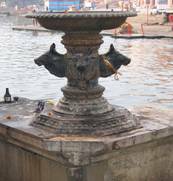 Kapaleshwar Mandir situated on the banks of river Godavari near Ramkund is one of the oldest temple in Nashik.The main feature of every Shiva temple is the Nandi which is supposed to be missing in this temple. 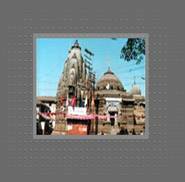 The Someshwar temple is one of the oldest temples dedicated to Mahadeva (Someshwar). 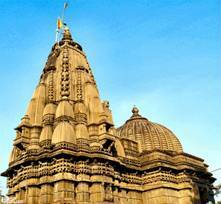 This temple is situated on the Gangapur Road, about 6-km away from Nasik city. It lies along the banks of river Godavari. This historical place is located on a wedge up in Trivashmi hill which is at a distance of about 8 km down the city on Mumbai-Agra highway.The main attraction of this cave are the exquisite carvings on the walls. It is a group of 24 Buddhist Caves which were dig out around 1 AD. It is this place from where lord Sita was taken away by Ravana.This place houses the idols of Lord Rama,Laxamna and Sita.Sita Gumpha is situated in Panchavati,a small village situated in the northern part of Nashik. This place got its name from the five Banyan trees present here.Panchwati is situated in the northern part of Nashik and history says that Lord Shri Ram and Sita along with Lakshman (also spelt as Laxman) stayed at Panchavati for some time. Ramkund is known as the 'Ganges of the south'. Many pilgrims visit this place and take a holy dip in the river Godavari.It is said that Lord Rama took a bath here, during his stay at Nasik. Shiridi is a small village, located in Kopargam Taluk, in Ahmadnagar district of the Maharastra State. Shirdi holds an important place on the pilgrimage map of India. It is about 285-kms and 6 hours' drive away from Mumbai (Bombay). This small village has a shrine of an old sage called Sai Baba, who lived in this village. This sage was the mentor and prophet of the villager's and was famous for his miraculous wonders. Tapovana which is situated near Sita Gupha was once a part of the sacred Dandakaranya forest and it is here where Lakshmana cut off the nose of Ravana's sister Surpanakha. This is a very famous picnic spot for the people of Nashik and is located at a distance of about 8 km to the west of Nasik near Someshwar Temple. Nandurmadhmeshwar also known as bird-lover's paradise is at a distance of 60 km from Nashik which is known for its bird sanctuary.This place is also known as the Maharashtra's Bharatpur.Nandurmadhmeshwar is home to thousands of migratory birds. October to March is the ideal season to bird watch. Bhandardara,a hill station is located at a distance of 70 km from Nashik.It also has a trekking destination - Mount Kalusubai. 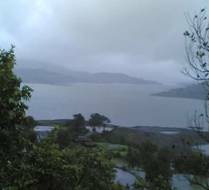 The largest earthen dam in the country and one of the oldest dams in Asia, Wilson Dam or Bhandardara Dam is at Bhandardara. The height of the dam is nearly 150 m. The overflowing water makes the Umbrella Falls, which is a picturesque sight during the monsoon season. This museum is the one and only of its kind in Asia and has a fine collection of researched and well-documented history of Indian currency. This museum is situated against the backdrop of the enthralling Ajneri Hill. The other collections in this museum includes photographs, articles, line drawings, replica, real coins and also a detailed analysis of the various currency systems that existed in the India from centuries together. This museum was founded by K C Pandey and is known for zeolites which gives a breathtaking colour and fragile structure formed as the result of a process in which a group of silicate minerals expel water when heated.Gargoti Museum houses a rock of apophyllite, stilbite and calcite measuring 2.2 x 2 feet and worth about $100,000. Nashik is famous for bronze and brass statues and jewellery especially beaded necklaces.Adgaonkar Bandhu, Adgaonkar Saraf, Adgaonkar Sons, Amruta Jewellery, Dhanvardhini Jewellers, Dusane and Sons, Gulawanchkar Jewellers, Heena Jewellery and J B Ankaikar Junnarkar Jewellers are some of the important jewellery shops of Nagpur.For clothing and fashion apparels tourists can go to Amarson Cloth Centre, Anil Cloth Stores, Shivaji Cloth Market Bhadrakali Nasik, Babubhai Cloth Store, Beauty Corner, Bombay Silk Stores, Deolali Cloth Stores, Ganpati Cloth Store, Gurunanak Cloth Stores and Harish Cloth Stores. Eating out has long since been a tradition that Nashikites have followed with enthusiasm. Nearest airport from Nashik is at Mumbai , which is 185-km away from the city. From the airport you can take a taxi to reach the bus stand. Nashik is one the major stations on the Central Railway and there are a number of convenient trains that connect Nashik to other cities and towns. The fastest train to Mumbai is the Panchvati Express, which does the trip in 4 ½ hours. Nashik is 185-kms from Mumbai and is well connected by road. Pune-Nashik highway is 220-kms away from the city. There are also several private and state buses available between Mumbai/Thane and Nashik.